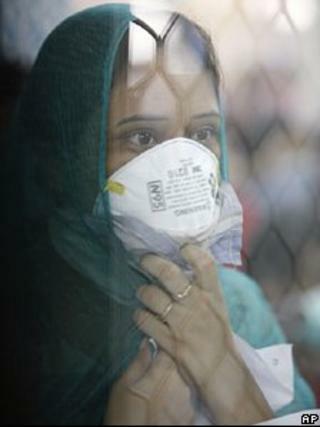 An outbreak of swine flu in India has killed at least 94 people in just over five weeks, reports say. The health ministry said more than 450 cases had been reported, mostly in the northern state of Rajasthan. Officials say they are investigating the cause of the outbreak, with some experts saying low winter temperatures are to blame. The H1N1 virus, which causes swine flu, first appeared in Mexico in 2009 and rapidly spread around the world. It killed 981 Indians in 2009, 1,763 in 2010, 75 in 2011 and 405 last year. It is thought the virus has killed 200,000 people around the world. Indian officials said 246 cases had been recorded in Rajasthan, where 54 people had died. The capital, Delhi, has reported three deaths so far. But, with more than 60 cases reported in the city in 2013, Delhi authorities have ordered 22 hospitals - including five private clinics - to set up isolation wards to treat cases of swine flu. Health officials said there was "no need for panic", but advised people to take precautions "for prevention and management of the disease". Swine flu is a respiratory disease which is caused by a strain of the influenza type A virus known as H1N1. Although the disease originated in pigs, it is now a wholly human disease and is spread by coughing and sneezing. Scientists say symptoms of swine flu in humans appear to be similar to those produced by standard, seasonal flu - fever, cough, sore throat, body aches and chills. Some people with the virus also experience nausea and diarrhoea. Experts say vulnerable groups include pregnant women, children under five, the over-65s and those with serious conditions such as heart disease, asthma, diabetes or immunosuppressive illnesses. Contagion: Could it really happen?